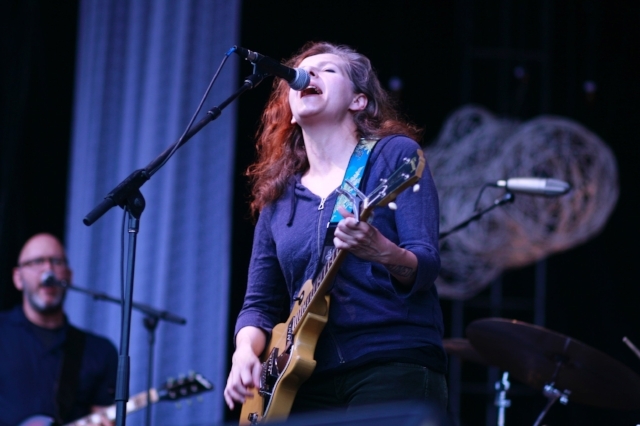 Next time Neko Case wants to make a collaborative album, like her "case/lang/veirs" project from 2016, maybe she'll consider teaming up with Eric Bachmann. They've already done a pair of duets, including a version of his "Sleep All Summer" on her new album "Hell-On," and their voices work beautifully together. Each is capable of booming power — his rich and resonant, hers blow-out-the-back-wall-and-make-you-cry — and also moments of startling intimacy, and the combination can be incredibly compelling. Bachmann played guitar in Case's touring band for a while, but the only time they had sung together on a recording was "Your Control," from Crooked Fingers' 2008 album "Forfeit/Fortune." The song is a masterclass in vocal interplay: their voices circle each other's, they sing soaring countermelodies, they nail vertiginous harmony parts, and the whole thing feels as vital as a heartbeat. "Sleep All Summer" also started out as a Crooked Fingers song, from the band's excellent and underrated 2005 album "Dignity and Shame." Bachmann shared vocals there with Lara Meyerratken, and while it's a pretty song with gut-punch lyrics, the lullaby-like guitar line gives it a sleepy feel. Case's version substitutes spare, melancholy piano, which emphasizes their voices. Bachmann, for one, has rarely sounded better: his voice is sonorous and weary, and there's an almost gentle quality as he tries to balance honesty with kindness: "I would change for you/ But babe, that doesn't mean I'm gonna be a better man," he sings, and no, you're choking up. And Case, well. One of the true pleasures of following her career is hearing how she has grown more nuanced as a singer, which makes her songs that much more devastating — and they've been pretty devastating all along. She sounds anguished here, as if she's desperate to understand how the relationship at the center of the song has crumbled, even as she tries to keep it from slipping through her hands. "Why won't you fall back in love with me?" she sings in tandem with Bachmann, her voice plaintive and wounded while he harmonizes as if his heart is breaking right there at the mic. The track is tucked away toward the end of "Hell-On," and though the album is full of compelling tunes (try "Curse of the I-5 Corridor," with vocals from Mark Lanegan, or "Halls of Sarah"), "Sleep All Summer" grabs on and doesn't let go. Along with the Crooked Fingers and Case versions, the National and St. Vincent recorded their take on the song for the "SCORE! 20 Years of Merge Records" compilation. As excellent as those artists are on their own material, their "Sleep All Summer" feels perfunctory, apart from the horn charts. Suffice to say that Case, and Bachmann, have recorded the definitive version.